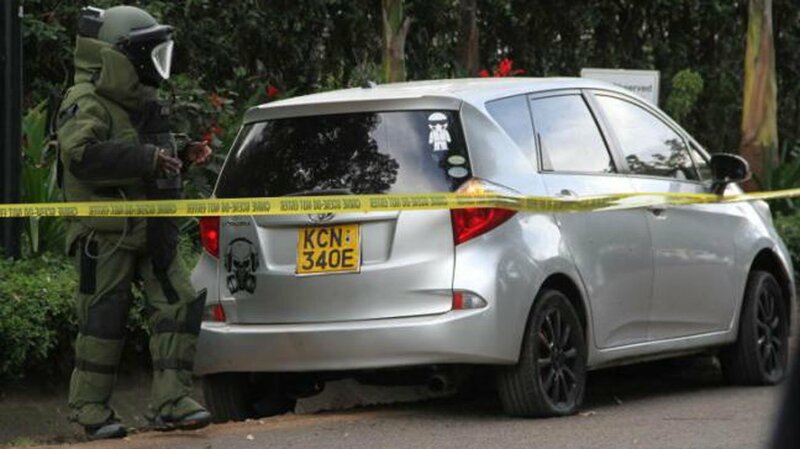 Friday, February 01, 2019- Police on Thursday arrested occupants of a car with a similar sticker to the one used to ferry Al-Shabaab terrorists who attacked the Dusit D2 Hotel complex killed 21 people. The car caused panic in Nyeri Town forcing members of the public to raise alarm and alerted police officers who arrested the occupants of the car. The with the image of a skull in the rear bumper was accompanied with the chilling message. “Dead men tell no tales. “A motor vehicle…was spotted at Nyeri Posta at around 14:00 hours. It had three occupants of Somali origin who were believed to be armed and preparing to commit a felony,” read a statement by the area Directorate of Criminal Investigations. Nyeri Town MP, Ngunjiri Wambugu, congratulated the residents for being vigilant and assured them all was well. “Car (owner) takes himself to Kayole Police Station. Confirms he was in Nyeri onwards to Narumoro. Being dealt (with) and so far there’s now no cause for alarm,” the MP posted on Facebook. “I would like to congratulate and thank all those who raised concern and shared this clip to have it acted on. This is essentially what ‘security-begins-with-me’ means,” he added.